Men’s Breakfasts seem to have been around forever. In many churches, breakfasts ARE the Men’s Ministry! What makes them so popular? • Food is always popular with men! • Get valuable information and inspiration from the speaker. Even if you don’t, there is still food! How can you get the best outcomes from your men’s breakfasts? • Quality spiritual food is the key to keeping breakfasts going strong. • Make the frequency sustainable. Monthly breakfasts are ok if you have a great team and dynamic speakers. Otherwise doing breakfasts really well 2-3 times per year is better. • Plan and execute it well. Use PK resources like the Planning Guide for Men’s Ministry Events. • Launch the next objective at this breakfast – eg guide men into Small Groups, sign up for an event, etc. 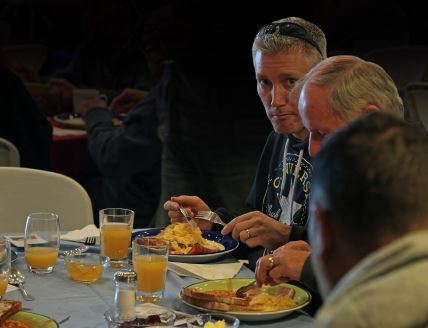 Men’s breakfasts can be a key strategic event for bringing men in and moving them along the growth path. These are a great opportunity to get to know other men better and develop friendships. The focus of the camp will determine if it is about having a good time with fun activities, teaching, or interactive ministry. How these are balanced is important in achieving the goals. Some camp programs are heavily weighted towards fun and social activities. This format will limit the long-term benefit of investing time and resources into a men’s camp. You get what you plan for. Set spiritual goals alongside great activities. Will the outcome include getting more men into ongoing groups and ministry/mission?